Airplane! – Games for Android 2018 – Free download. Airplane! – Realistic flight simulator on passenger aircraft. Airplane! 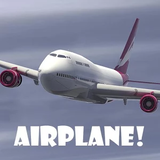 for Android is a pretty basic flight simulator game. There are a few different planes to choose from at the start, and many more to unlock or buy. The handling didn't appear to differ that greatly between planes, but things may get more interesting when you get to flying a zeppelin. There's a choice between touch and tilt controls. Trust me, you're going to want to leave this one on touch controls. The tilt controls make it difficult to even take off without crashing. Each mission is mercifully short and straightforward. Just take off, point your aircraft in the direction on your radar, leave it flying a couple of minutes (there's a fast forward button); then either land the plane yourself, or choose auto land for half the points. Landing safely is challenging; but then I've never been much good at landing planes in games. The main menu is hard to read on a small screen, but you can just about manage it. There are three camera views to choose from. The scenery changes a little bit from islands, to desert to snow capped mountains. Airplane! is visually appealing, but after a while a bit pointless, as the missions don't change very much. Overall, it strikes a decent balance between realistic flight mechanics, and providing a game that can be enjoyed in a short few minutes on a mobile platform.